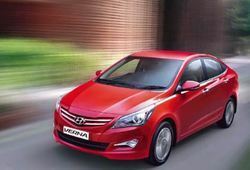 The 4S Fluidic Verna is what we call a revolution. Stylishly designed, Sophisticated interiors, Speedy performance and a Safer drive. We are offering a wide range of Hyundai I20 Car. Trident Hyundai was founded in Sep 1998 with a motley team of 22 young members. From one showroom and one service centre, Trident has today grown to be one of the largest Hyundai dealerships in the country. Sales now peak to over a thousand cars a month and the network has increased to 4 showrooms and 11 service centres.